Having outed a host of new cameras in the days leading up to CES 2012 imaging specialist Fujifilm has reiterated its previous showings demonstrating 19 new snappers at the Las Vegas based convention. Joining a host of rugged compact cameras headlined by the Fujifilm XP150, the Japanese camera specialist has shown off a range of zoom heavy models and a selection of budget snappers. Leading the field in this hefty barrage of mid and entry level devices is the Fujifilm FinePix HS30EXR. Featuring a single fixed lens the FinePix HS30EXR combats a seeming lack of versatility with a wide scale zoom allowing users to shoot at anywhere between 24 and 720mm. With a 30x optical zoom Fujinon lens complemented by 60x intelligent digital zoom the HS30EXR covers all basis with its 16-megapixel EXR-CMOS sensor ensuring high quality snaps at all focal lengths. A 3-inch rear-mounted screen allows for clear image playback whilst a sunny day mode ensures pesky glare does not hamper image viewing. As an added party piece and the latest essential tool in any mid to high-end snappers arsenal, the HS30EXR boasts 1080p Full HD video recording capabilities. 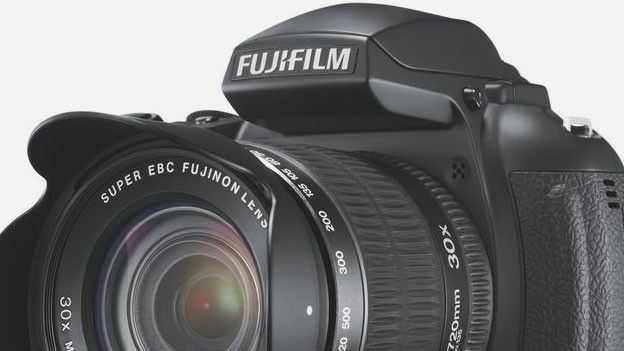 Remaining cagey around a precise FinePix HS30EXR release date Fuji has revealed the 16-megapixel snapper will land in “Spring 2012” with a currently unannounced price tag. The Fujifilm FinePix HS30EXR price tag has been set at $499.95 (£324.20) in the US. Are you in the market for a versatile fixed lens camera, does the Fujifilm FinePix HS30EXR appeal to you? Let us know via the comments box below.